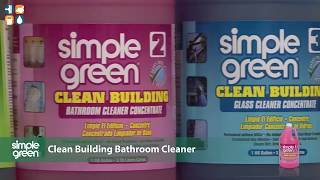 Simple Green Clean Building Bathroom Cleaner Concentrate is specifically formulated for cleaning scale and scum types of soils typically found on hard bathroom surfaces, the Clean Building Bathroom Cleaner Concentrate offers economical dilution, does not contain fragrance and is formulated without volatile organic compounds that can adversely impact indoor air quality. Its pink color makes it easily identified when diluted into secondary containers. Safe to use on washable hard surfaces such as ceramic, glazed tile, Corian, Formica, grout, faucets and fixtures, porcelain, and cured fiberglass, it’s also non-toxic, biodegradable, non-caustic, and non-flammable. This breakthrough product line was designed specifically for industrial/institutional use in schools, universities, government facilities, hotels, motels and other hospitality/lodging facilities, hospitals, clinics, nursing homes, day care centers, and any place where professional cleaning is required, but health and safety are of the utmost concern. The Simple Green Clean Building line of products has met all aspects of the Green Seal GS-37 Standard, including reduced health, safety, and environmental impact of formulations as well as product efficacy requirements. These products comply with the environmentally preferable product purchasing programs that are in place throughout federal, state, and municipal governments. Sunshine Makers, Inc. - Simple Green Clean Building Bathroom 2 Cleaner Concentrate, 1 Gallon Bottle, 2 Bottles per Carton.